Coming close to the end of the year it seems the appropriate time to use this column for a look at the sky at tera electron volt (TeV) energies, and in particular at our Galaxy as viewed by H.E.S.S. In Fig. 1, the Galactic Plane is shown in four ranges of Galactic longitude, covering from about +60 degr. to -80 degr. longitude , and revealing a large number of gamma-ray sources lining the Galactic equator. The sky image has been created by evaluating the number of gamma rays detected within 0.22 degr. of each point in the sky. This radius is somewhat larger than the 5 arc-minute precision with which gamma-ray directions are measured with the H.E.S.S. telescopes, but it helps to reveal sources which are moderately extended. 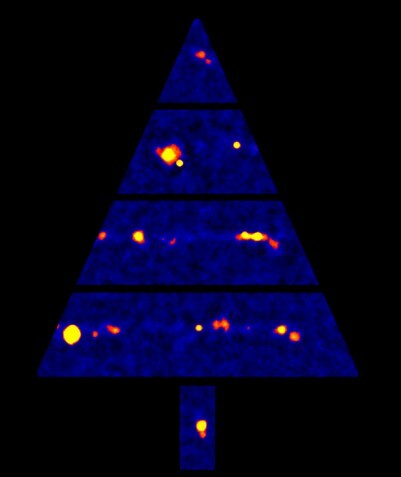 About 40 sources of gamma rays are visible; a few more can be detected by optimizing the integration circle for specific source sizes. Most of the sources indeed appear as extended regions of gamma-ray emission, with typical source sizes of a few tenths of a degree; point sources such as LS 5039 (HESS J1826-148) or PSR B1259-63 (HESS J1302-638) are the exception. The fact that sources cluster within a fraction of a degree from the Galactic Plane indicates that they must be quite far away, typically a few kpc. Their angular sizes then translate into scales of tens of parsecs. 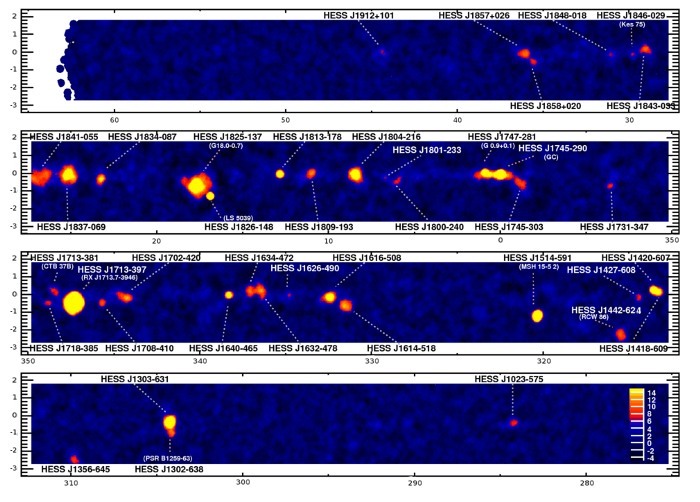 Galactic very high energy gamma ray sources include supernova remnants such as RX J1713.7-3946 or RCW 86, a number of pulsar wind nebulae such as G18.0-0.7, G0.9+0.1 or MSH 15-52, the binary system LS 5039, the stellar cluster Westerlund 2 (HESS J1023-575) and a significant number of unidentified sources without obvious counterpart, such as HESS J1303-613 or HESS J1841-055, one of the new sources reported by H.E.S.S. at the International Cosmic Ray Conference (ICRC) 2007 (Fig. 2). Many of the sources shown in Fig. 1 are discussed in more detail in the H.E.S.S. Contributions to the ICRC 2007. For a view of the full VHE gamma ray sky, a catalog of sources and a collection of references, see also TeVCat.